Upon arrival at Testi in Stoke Newington, we were struck by the rich decor. The walls are adorned with traditional Turkish items of interest such as paintings, rugs and all manner of crafts. We’ve never been to Turkey, but would like to think this is what it is like. The restaurant was very full for a Wednesday evening which is always a sign of good things. There is a counter at the front for those who wish to take away their cuisine, though we decided to eat inside. For the meat curious among you (and those pondering about the name) there is testicles on the menu, if you wish to take a tentative bite. We weren’t feeling so adventurous though. The herbivore among us decided to go for a stuffed aubergine dish that was served with a big basket of flatbread and salad. I went for pidi, a traditional Turkish pizza. A little like normal pizza but without the cheese. I was bitten by a bout of food envy – though the pizza was enjoyable, it was a little samey after awhile. Before long I was helping Jodi out with her bread and salad. Still not managing to finish the lovely bread though, the kind staff allowed us to take it away with us. Upon leaving, we were given a free handtowel and a mint to freshen us up. 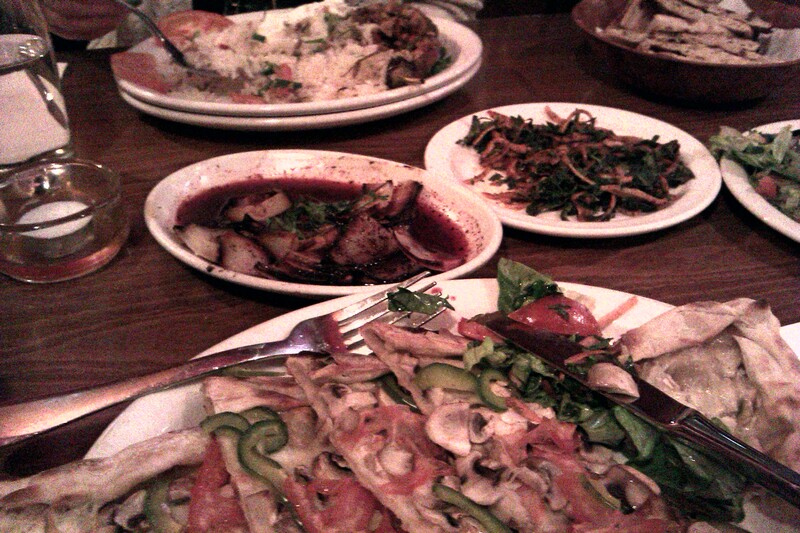 Testi is a charming place and amongst the plethora of Turkish establishments around Stoke Newington, we would definitely recommend this one. Service 8/10, food 7/10, environment 8/10. This entry was posted in Uncategorized and tagged dinner, Dinnergeddon, Eating out, Food, London, stoke newington, testi, turkey by dinnergeddon. Bookmark the permalink.